The Finish Template is designed to signal the end of a lesson, and usually offers some form of congratulations alongside an image. From the Finish Template, you can redirect your Participants to other topics in your Lesson, other Lessons in your Course, or an external URL. Select the Finish Template from the ‘Text, Images & Video’ panel. 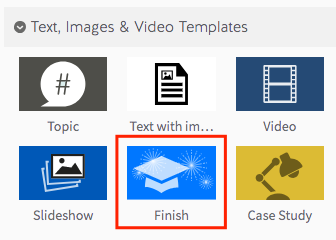 Drag your Finish Template into the Lesson Pathway. Give your new screen a title. To begin editing your Finish Template, click the ‘edit’ button. From the edit screen, you can give your Finish Template a description and edit it’s title. Upload an image for you Finish Template using the ‘Add Image’ button. We recommend using a full sized image for this template, so try sizing it at 1170 x 55o pixels. You can choose where you’d like your Finish Template to redirect to from the ‘Finish Navigation’ box. Choosing one of these options adds a button that will direct the learner to a new screen. To a specific module: choosing this option allows you to choose a specific module from within the course to redirect to. To a customer URL: Choosing this option adds a button that will direct the user to any URL of your choice. To preview your Finish Template, click on the ‘preview’ icon.